More from BuzzFeed UK. 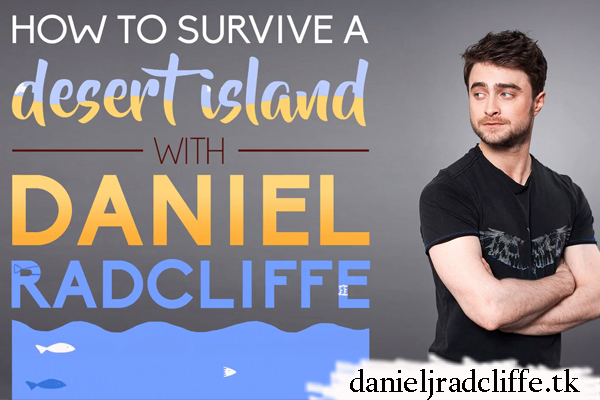 How to survive a desert island with Daniel Radcliffe. Here's the other interview in promotion of Swiss Army Man in case you missed it. What three books would you take with you? What three types of snack would you take with you? Dan: The three types of snack I’d take with me on a desert island would be… Some sort of bottomless bucket of ice cream that never runs out. Some sort of meat. Like, I don’t know, bacon. Is that a snack? Do you just have bowls of bacon at parties? Yeah, bacon. Ice cream, bacon, and something else that’s super healthy. Cheese. Some nice cheese. I’m on a desert island, who am I trying to impress? OK, this is a stretch. If you could take a phone or tablet with you that had enough battery life to watch one film, but you weren’t allowed to call anyone because you don’t have any service, what movie would it be? Dan: For similar reasons to Master and Margarita, there’s a film called Matters of Life and Death, with David Niven. It was made in the late forties, and if you haven’t seen it, you have an incredible treat ahead of you. It’s one of the most magical and beautiful, amazing films ever made. You also have enough battery life to listen to one album. What would it be? I’ll go with the Pixies and “Doolittle”, because there’s a good mix of stuff on there. Would you rather have to hunt or forage for your food? Dan: I guess I’d have to hunt, rather than forage, because the things I’d be foraging would be like, fruit and nuts, and that’s going to get really boring really quickly. So if I wanted actual meat – which, as you can tell, is a theme for me – then I would have to hunt. If you could choose one famous person to be stuck on a desert island with, who would it be? Dan: Somebody very strong. The Rock! So, you know, he could carry stuff and help me survive. He seems like he’d be very capable in that kind of environment. I’m not really built for that sort of environment. And, you know, if I needed stuff from the tops of trees I could stand on his shoulders and climb, I’m quite agile. I could also get into small places that he couldn’t. I feel like it would work well. That's just too funny. I like the pixies. bacon and ice cream.. I wonder if when his mum was pregnant with him if that is what she ate? lol Oh and I stole all those gifs. but I am sure you knew that .